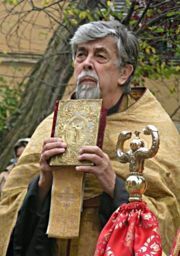 The Very Reverend Boris Bobrinskoy is an Orthodox priest and protopresbyter of the Ecumenical Patriarchate. He was Dean and Professor of Dogmatic Theology at St Sergius Institute, Paris, and Rector of Holy Trinity Orthodox Church, Paris. Boris Bobrinskoy was born in Paris in 1925, the son of Russian parents who migrated to France after the 1917 Revolution. Following the death of his mother when he was only ten, he was sent to boarding schools in Namur (Belgium) and Paris run by Jesuits of the Byzantine rite. In 1942 he took Father Cyprian (Kern) as his spiritual father, and served as an acolyte at the St Alexander Nevsky Cathedral on Rue Daru throughout World War II. After receiving his baccalaureate in 1944, Bobrinskoy began his theological studies at the St Sergius Institute, the same year as John Meyendorff. There, he came under the influence of faculty members such as Fathers Georges Florovsky, Nicholas Afanasiev, Cyprian Kern, and Alexander Schmemann, Antony Kartashev, and Leon Zander. He was also strongly influenced by Vladimir Lossky, who was Dean and Professor at the St Denys Institute. In 1949, he completed his studies with the submission of his thesis on the mystery of chrismation in fourth-century Syro-Palestinian tradition. Bobrinskoy began his master's work under the direction of Florovsky, who arranged for him to study for two years in Athens, Greece. Upon his return to St Sergius, he began teaching history, but in 1954 he accepted the chair in dogmatic theology (which he held until 2009). This was followed three years later by his marriage to Hélène Disterlo, who was to give birth to the couple's three children. He was ordained a deacon in the spring of 1959 and priest in the fall. In 1969, Father Boris became the Rector of Holy Trinity Orthodox Church, the French-language congregation that meets in the crypt of St Alexander Nevsky Cathedral. He is now retired near the Orthodox Monastery of the Veil of Our Lady (Bussy-en-Othe, France). Communion de Saint-Esprit. (Abbaye du Bellefontaine, 1992). ISBN 978-2855893563. La vie liturgique. (Paris: Cerf, 2000). ISBN 978-2204065290. Le mystère de l'Eglise: Cours de théologie dogmatique (Paris: Cerf, 2003). ISBN 978-2204070911. Je suis venu jeter le Feu sur la terre: Homélies et éditoriaux sur laPentecôte – Suivi par les Prières de l'Esprit (Paris: Les Éditions du Désert, 2003.) ISBN 2914857063. Maxime Egger, "Toward a Transparencyin the Holy Trinity: The Life and Work of Father Boris Bobrinskoy", in Bobrinskoy, The Compassion of the Father. This page was last edited on October 30, 2015, at 16:28.